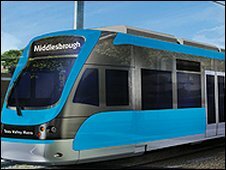 The creation of a metro system in the Tees Valley has moved a step closer. It is hoped that the new network will run between between Darlington and Saltburn, calling at all existing stations and five new stops. The Interim Regional Transport Board has approved a £30m project, including two new railway stations, and the government has agreed in principle. One station will be at Middlesbrough's James Cook University Hospital and the second in Redcar and Cleveland. Durham Tees Valley Airport's station will also be relocated and new platforms will be installed at Darlington and Middlesbrough stations. Station improvements will be carried out at Eaglescliffe, Thornaby, and Hartlepool. The government has agreed in principle to the regional programme, subject to affordability and quick delivery. It would run on existing rail lines and use funding planned for improving and repairing railways. There are hopes for a second phase to the network, with an extension to Hartlepool and Nunthorpe.